Every one’s life marriage is a very special kind of ceremony. Here i am presenting best wedding songs in Hindi, i think it will make more special on your day. A successful marriage need falling in love many times , always with same person.These songs may be help you fall in love with your partner. No matter how busy your days may be, make a time and pick the best song for your wedding. May this new beginning , bring all the enjoy and happiness in your life. Might you always stay in love each other. Here i am giving the best Indian marriage songs in Hindi, by using these bollywood wedding songs make it more wonderful on your wedding day. Indian weddings are becoming more eccentric than ever! afar from the Indian traditions that have been followed for years, a lot of new cultures added to make it more beautiful , fun and interesting. one of the most fun part is welcoming the groom.In ancient times, the groom and his family would travel to the bridal’s home town for the wedding. The entire town would play host and welcome their arrival with pomp and ceremony. This is called maaplai azhaippu the baarat in north side. The groom often enters a stride horse, carriage or open roof car. When groom finally arrives at the wedding venue to full sound music and dance filled welcome by the bridal’s family. After that bridal’s entry into the wedding ceremony. This is one of the most favorites event is bridal entry. And it is one of the most awaited moment in wedding day. 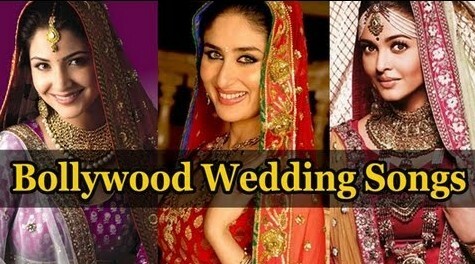 Also check this list of bollywood dance songs and download bhajans mp3 for free. The Groom, families, friends and other relatives wait to catch a glimpse of the bridal as she enters into the wedding venue decorate with stunning dress, jewels, makeup it would be every one fall in love with her. Marriage means fun and fun means marriage. in Indian wedding ceremony not only rituals and customs but also there are so many funny things are there here i will share with one of the most amazing part of whole marriage. After hectic schedule of the wedding, usually the newly wed wife calls her husband for play. it’s called to add merriment of one and all put together follows list of playful games in the wedding time. The bride marking the groom’s feet with color paste fanning him, they are showing him a mirror, breaking laddus like thin, roasted lentil flour crisps over each others head, wrenching the betel pack from each others hand, rolling the coconut from one to another as in ball-play, and so on. During these games, the ladies sing songs poking fun at the bride, groom and the in-laws. They will share some most memories in whole life Finally the most emotional send off is called vidai. Vidai marks the leaving of the bride from her the parental house. the bridal’s family members becomes so emotional during the send off. It will be remembering day of every women’s life. There is no more lovely, friendly, charming relationship, communion, or company that a good marriage. Not all brides and grooms are natural dancers, but each couple is excited about making the first dance worth remembering. Dancing brings a couple closer. Just avoid all tension and feel free to choose best song. Rock on the floor with full of energy. Here we have listed top marriage songs in Hindi for all wedding functions. Hello, Here I am Deepshikha. After the experience of working as Software Engineer and Assistant Professor, my passion towads Fashion bought up me here. I have started last year to write for you. Here this blog is related to style,fashion and beauty. Yes really nice song. Thanks for the suggestion will add it in the list.